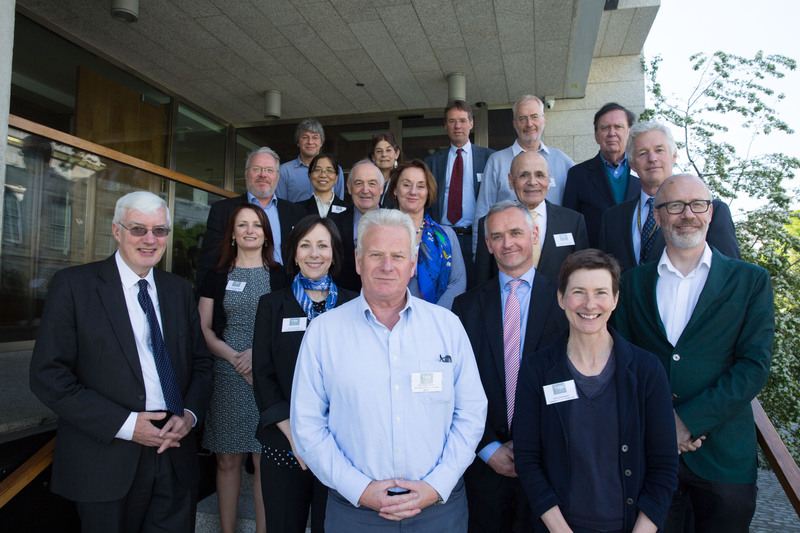 Wednesday, May 13th 2016: The TILDA research team and affiliated researchers presented to members of the TILDA Scientific Advisory Board and other guests during the one-day event held at Trinity College Dublin. Presentations included the Global Brain Health Institute; Technological Assessments in Longitudinal Studies; Chrono-Biological Markers of Ageing; Knowledge Exchange Seminars on Hypertension; The Relationship Between Kidney Disease and Ageing; Sexual Activity and Relationship Quality in Older Age; and Housing and Older Adults in Ireland. Pictured above (from back, left to right): Prof. James Nazroo, Prof. Lisa Berkman, Prof. Aartjan Beekman, Prof. Charles Normand, Prof. Jim Smith, Prof. Robert Wright, Prof. Yaohui Zhao, Prof. Brendan Wheelan, Prof. Rose Anne Kenny, Prof. John Henretta, Prof. David Weir, Prof. Robert Clarke, Dr Christine McGarrigle, Prof. Stacy Tessler Lindau, Prof. Finbarr Martin, Prof. Alan Barrett, Prof. Carol Brayne, and Prof. Ian Young.